The field of urban infrastructure management aims to build a framework of interdisciplinary knowledge related to strategic management in the construction and maintenance of urban infrastructures, not only from the viewpoint of economic efficiency but also of"human security engineering." 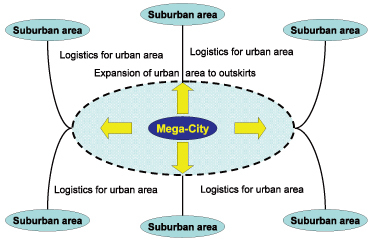 In considering development and maintenance strategies for urban infrastructure in Asian Megacities, this area posits a model of linkage between the mega-city and suburban areas (as shown in the figure below). Rapid expansion of urban areas in Asian Megacities cannot be achieved without the supply of various resources (such as food, energy and human resources) from suburban areas. Therefore, the formation of effective (rear-area) logistics support from suburban areas is essential for the development of mega-cities. Based on this viewpoint, studies in the field of urban infrastructure management have two types of focal point: 1) problems due to the expansion of mega-cities themselves, and 2) problems associated with linkage to the suburban areas that support the development of mega-cities. This area contributes to the development of techniques and the establishment of institutions to solve concrete problems in Asian megacities, proceeding with projects such as establishing risk management strategies against land subsidence in Bangkok, constructing city logistics in consideration of pirates and terror attacks in Singapore, and developing technologies of carbon capture and storage in Jakarta.